Seized by N.C. Militia three months before firing on Fort Sumter, Governor Ellis ordered its return to Federal authority; three mi. E.
Fort Caswell is a casemated, masonry fort constructed by the United States Army Corps of Engineers between 1826 and 1838 on the eastern end of Oak Island. 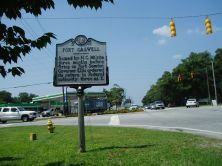 The fort is named for Richard Caswell, first governor of the state of North Carolina. Designed by Brigadier General Simon Bernard, a former aide-de-camp to Napoleon who came to America after the emperor’s fall from power, Fort Caswell was part of a national chain of forts built for coastal defense. Known as the Third System, that chain included Fort Macon. Although the pentagon-shaped fortification contained over sixty gun emplacements, the position was never fully armed, and, up until 1861, only a handful of U. S. Army caretakers garrisoned the post. 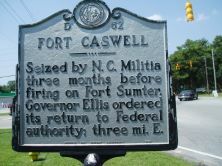 In January of that year, following South Carolina’s secession from the Union, local citizens, fearing Federal occupation of North Carolina’s military installations, seized Fort Caswell from the single United States soldier at the site. Governor John W. Ellis ordered the secessionists to return the fortification, as North Carolina had not yet separated from the Union. On April 16, after the Civil War began, local militia again seized Fort Caswell. Fully armed with nearly thirty heavy guns and strengthened by the construction of a massive earthwork around the brick walls, the fort became one of the main Confederate defenses of the Cape Fear. Although never directly attacked, the fort’s guns often engaged Union warships on blockading duty. Yet despite continual occupation throughout the entire conflict, not a single soldier was killed in action at the fort, although several died of disease and one deserter was executed by firing squad. On January 17, 1865, Confederates, retreating from Fort Fisher on the opposite side of the river, detonated the powder magazines at Fort Caswell, destroying the entire southeast face and damaging the western face. A witness described the scene as similar to one in which “a mighty volcano had sprung its blazing contents from the sea into the sky.” The following day, Union forces seized the abandoned position and Fort Caswell once again became a Federal fortification. In the 1880s, Secretary of War William Endicott slated the position to receive more modern defenses. Construction continued from 1894 to 1904, and considerably altered the original layout of the fort, including the addition of gun mounts and seawall now present. In 1923, the War Department closed the installation and sold the fort to a Florida development firm who unsuccessfully attempted to convert it into a resort, complete with swimming pools made from gun emplacements. Fort Caswell again entered the country’s service in 1941 when the U. S. Navy purchased it for use as a section base. At the conclusion of World War II, the fort fell into disuse once again. In 1949 the U. S. government sold it to the North Carolina Baptist State Convention for $86,000. Today, the fort serves as a retreat and conference center for churches and other groups affiliated with the Baptist Convention.